Epiphytic plants like Anubias, Bucephalandra or ferns can be combined perfectly with the hardscape in aquascaping. They can be attached to driftwood and rocks, where they will soon take root and grow. Among the rarer aquatic plants, the manifold species and forms of the genus Bucephalandra are especially charming, as they flower under water quite frequently, and as their leaves can assume the most different shades of green. Anubias are very robust plants, usually of an intensive green colour. Especially the small-staying forms of Anubias barteri are perfect for aquascaping. Among the ferns, Microsorum pteropus is characterised by its large number of different variants. Narrow-leaved forms like "Narrow" or the extremely narrow-leaved "Needle Leaf" are perfect epiphytes for hardscape. With its feathered leaves, Bolbitis heudelotii reminds of ferns found in dense pristine jungle. Epiphytic water plants are highly suitable for aquascaping purposes and can bring an enormous sense of natural beauty to a layout. 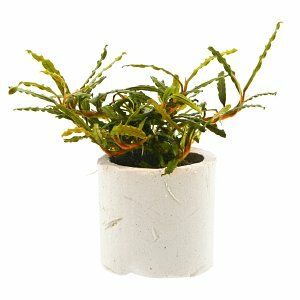 Bucephalandra sp. ""Braun-rot / Serimbu"
Epiphytes are a special gift of nature. 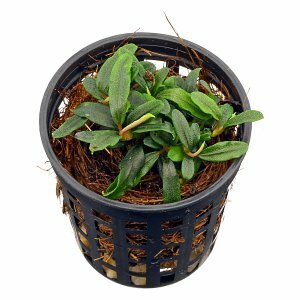 They can attach themselves to hard surfaces and are therefore ideal for greening hardscape, i.e. decorative materials such as stones and wood. Such aquarium plants thrive independently of the substrate and can be attached inside the aquarium in many different ways. Epiphytes offer many great possibilities for aquarium design, and Aquascaping can't be imagined without them! Among them, there are also extremely simple, robust species that are suitable for almost any type of freshwater aquarium. A great selection of epiphytes, both common species and rare specialities, can be bought in our online shop. Most of these special aquarium plants were originally found along fast-flowing forest streams and rivers in the tropics and subtropics. There they sit on rocks, tree roots, and sometimes also in waterfalls and rapids. Here the water level changes frequently, so that the plants sometimes fall dry and sometimes are flooded. They are particularly adapted to strong currents and are therefore called rheophytes ("flow plants"). In those difficult-to-colonize places, the rheophytes have little competition to fear from other plants. Although most aquarium-suitable epiphytes grow only temporarily submerged in their natural habitats, they are nevertheless fit for cultivating them constantly under water (submersed) in an aquarium. In an aquarium, they won't need the occasionally roaring current of their natural habitats, but nevertheless, a sufficient flow is beneficial to aquarium plants in general. Most epiphytic plants grow slowly and are shadow plants. This makes them the perfect choice for a dimly lit aquarium. 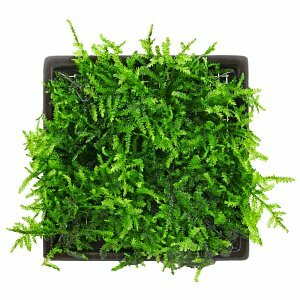 But they can also be used in strong light aquaria, provided that the plants are completely and harmoniously supplied with macro- and micronutrients as well as carbon dioxide (CO2). Preventing algae growth is important for keeping the long-lived leaves of these aquarium plants sightly for as long as possible. 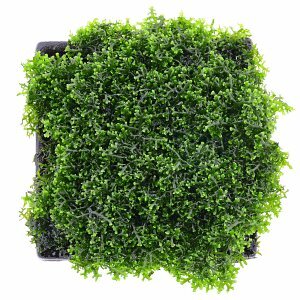 It is recommended to use not only slow, but also fast-growing plants in strongly lit tanks, which compete with algae by growing vigorously. It is noticeable that most aquarium epiphytic plants belong to the arum family (Araceae), or ferns and mosses. True classics are the Anubias barteri varieties and the Congo fern (Bolbitis heudelotii) from tropical Africa as well as the Asian Java fern (Microsorum pteropus), which is extremely varied. These species have long been proven to be robust aquarium plants. Especially the spear leaves (Anubias) with their rough leaves resist big, rough or herbivorous fish and are often used for planting cichlid tanks. 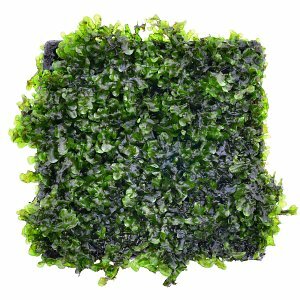 More recently, many decorative forms such as "Trident", "Orange Narrow" and the real "Needle Leaf" Java fern have become more popular and are a true enrichment for aquascaping. 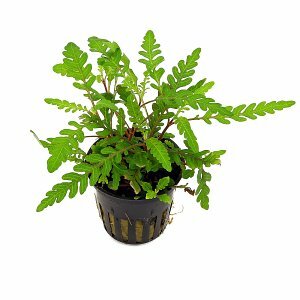 In addition, Microsorum pteropus with its dark brown root thicket offers natural hiding places and spawning grounds for fish and other aquarium animals. The java fern and other epiphytes are appreciated in breeding tanks without a substrate layer, where these aquatic plants are fixed on stones or free-floating and can be quickly removed if necessary. 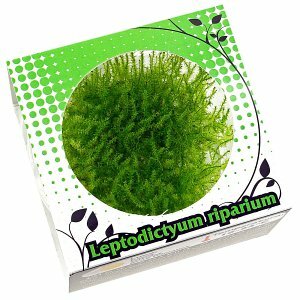 In the last few years, a number of new aquarium epiphytes have become known and popular. A fascinating variety of leaf shapes and colours can be seen in the many, mostly still undetermined Bucephalandra-species from the island of Borneo, which also frequently bloom under water. Schismatoglottis roseospatha, from Borneo as well, looks not unlike a Cryptocoryne. This rheophyte has been in cultivation for a long time and is easy to keep, but has only recently become more widely known. The dark striped fern (Hymenasplenium obscurum) and tiny, tender skin fern plants such as Crepidomanes cf. malabaricum also refine the aquarium flora with interesting epiphytic plants. Many dwarf Anubias-forms like 'Petite' ('Bonsai') and 'Pangolino' have been selected from stocks of Anubias barteri var. nana. Although not a typical epiphytic plant, the stem plant Hygrophila pinnatifida from India has proven to be a very decorative plant for hardscape. Especially their creeping shoots grow more or less firmly onto stones and wood with their holdfast roots, and with regular trimming and pruning the stock can be formed and kept low. An interesting case here is the Eriocaulon sp. "Japan Needle Leaf". From our experience, this grassy, long-leaved Eriocaulon sticks to stones with its roots pretty well and should definitely be tested more for its suitability as an unusual epiphytic plant. Aquarium epiphytes are almost always rhizome plants. They have a creeping rootstock (the rhizome) that can be compared to a horizontally growing stem. New leaves and adhesive roots form at the shoot tip. In order for the roots to adhere firmly, the growing, younger shoots must come into stable contact with the ground. The many possibilities for fixing plants onto the hardscape are described in the following article: Epiphytes. Side shoots develop on the rhizome, which causes the plant population to grow over time. This can be reduced if necessary by splitting, which also makes it easy to propagate the plant. Tips for propagating rhizome plants can be found in this article. Java fern (Microsorum pteropus) and forms of Bolbitis heteroclita multiply abundantly through young plants (adventitious plants) on older - especially severed - leaves. The rhizomes and roots of the epiphytes do not tolerate oxygen deficiency. They should therefore not be buried in the substrate, otherwise you risk rotting of the rhizomes and the death of your plant. Dadurch unterscheiden sich diese Aquarienpflanzen von vielen typischen Wasserpflanzen, die dank ihres Luftgewebes (Aerenchym) sogar an sehr sauerstoffarmen Faulschlamm angepasst sind. Es gibt aber die Möglichkeit, Aufsitzerpflanzen auf dem Bodengrund zu befestigen, zum Beispiel mit durchsichtigen Plastik-Pflanzenklammern von JBL (ProScape Plantis). Most aquarium mosses are epiphytes, too. In the tropics as well as in colder latitudes, stones, branches and tree roots in and around streams are often covered with beautiful moss carpets. Aquatic mosses make it possible to recreate such natural sceneries in the aquarium. Unlike the higher developed epiphytic plants, mosses do not use roots to hold onto roots and stones, but hair-like organs, so-called rhizoids. 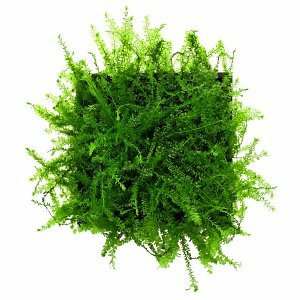 Some mosses, however, will hardly grow onto the substrate inside the aquarium, but these are also best placed on the hardscape by tying or glueing. Very natural-looking, almost jungle-like growth patterns can be created by combining mosses with other epiphytes such as ferns and arum plants, which are usually associated with mosses in their natural habitats as well.